with Place of Hope and the St. Lucie Mets at First Data Field! 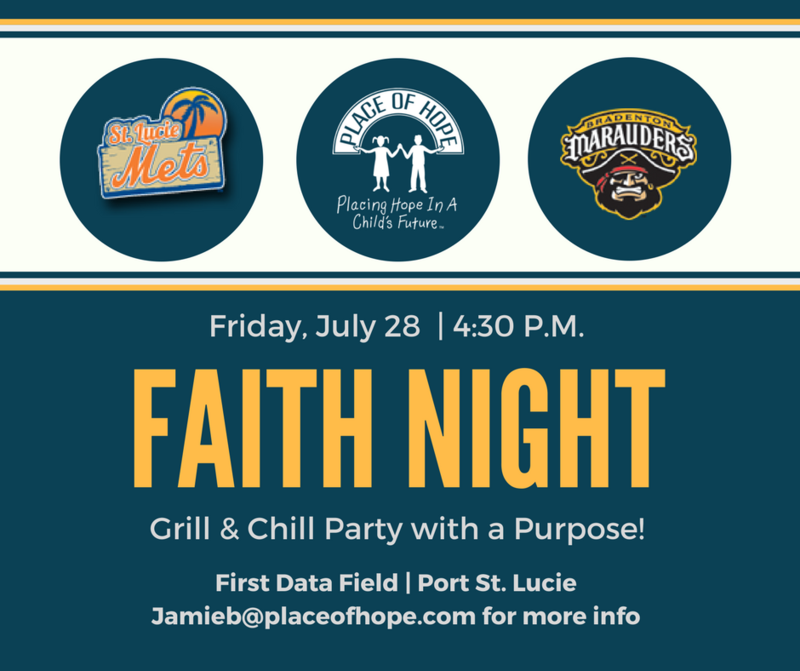 Friday, July 28, The St. Lucie Mets is hosting their annual Faith Night and Place of Hope will be there. Game time is 6:00 P.M. and will be followed by a worship experience and testimonies from the St. Lucie Mets! Any Tebow fans out there?! Tickets are $7 each with $3 coming back to Place of Hope! We have reserved 250 tickets for Place of Hope supporters. Get yours this Sunday in the lobby at Christ Fellowship. Come early for our Faith Night “Grill & Chill” where we will be grilling some hot dogs and chilling out with others in the community and sharing in fellowship. Our “Grill & Chill” kicks off at 4:30 P.M., is free of charge, and families are welcome. The hot dogs and drinks will be a suggested donation, so whatever is on your heart to give is welcomed and appreciated. Look for the Place of Hope tent in the parking lot. Create lasting memories by sponsoring a foster family ballpark experience! To learn more about fostering a family, please email jamieb@placeofhope.com.